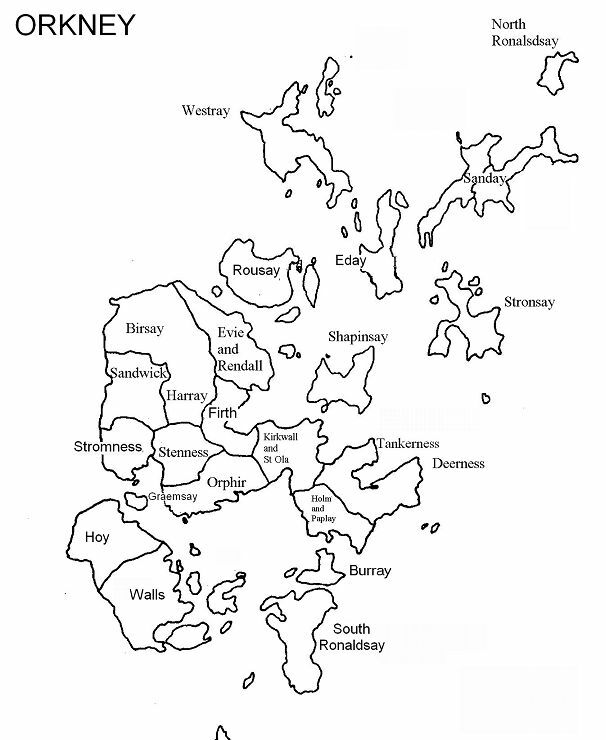 This overview is based on dialectal distinctions in Orkney Scots as of the beginning of the 20th century mentioned by Hugh Marwick in his "Orkney Norn" (1929) on p. 228, where he describes phonetic distinctions between various Orkney parishes (see the table below). These variations are of a rather minor nature, except the remote parish of North Ronaldsay which noticeably stands out. In addition to phonetic issues, Marwick recalls one grammatical distinction: formerly feminine names in -o ( < ON -a) regularly change the ending to -ick in East Mainland and South Isles: Willick for Whillo, Merrick for Merro (Mary), paalick for paalo etc. (see p. XXIX). The overview below reflects phonetic variations in the pronunciation of words of Nordic origin that were still in use in Orkney in the early 20th century, although there is no doubt that in addition to Scandinavian features there are ones coming from English/Scots. Eday "" "" "" "" "" "" "" "" "" "" "" "" hil te:l "" ""
Stronsay "" "" "" "" "" "" "" "" "" "" ke:l "" "" til "" ""
Westray "" "" "" "" "" "" "" "" "" "" kjil "" "" "" "" ""
Holm "" "" "" "" "" "" be:n ste:n he:m in ke:l "" "" "" ʃe:m ""
Orphir "" "" "" "" "" "" bɔn stɔn hɔm wan "" "" ho:l "" "" ""
Birsay " lɔŋ tɔŋl "" "" "" be:n ste:n he:m e:n "" "" he:l "" "" ""
Evie tɔŋ "" "" "" "" "" "" "" "" "" "" "" "" "" ʃim ""
Firth taŋ loŋ taŋl "" "" "" "" stɔn hɔm wan "" "" ho:l "" ʃe:m ""
Harray "" laŋ "" "" "" "" "" ste:n he:m "" "" "" he:l "" "" ""
Burray "" "" "" "" "" "" " sto:n "" wan "" "" "" "" ʃim ""
Walls "" lɔŋ "" "" "" "" bo:n "" "" "" "" "" he:l "" ʃe:m ""
1 In all districts there is a tendency for bɔn,stɔn,hɔm to supplant the other forms. 2 After [k] there is always and everywhere a tendency to interject a [j] sound when a front vowel follows, but in some islands it is more marked than in others.